We recently visited LEGOLAND® and, as they say, we let the train take the strain! We travelled by train LEGOLAND® Windsor and used a Family & Friends Railcard. A Family & Friends railcard is £30 per year and you get up to 1/3rd of adult fares and up to 60% off child fares. It also gives you 2for1 entry to selected attractions – including a LEGOLAND® Windsor! Travelling by train was a rare treat for Lily and she was really excited. Lily loved waiting for the train on the platform and became a bit of a train spotter on the platform. She loved watching them go by and waiting to spot our one. We have decided to use the train more as the discounts are amazing and it adds an extra bit of excitement to the day! The closer the train got to Windsor & Eton Station the more excited Lily became. She spent most of the time looking out of the window trying to find Windsor Castle and I wish you could have seen the excitement on her little face when it came into view. When we arrived at LEGOLAND® Windsor we checked in to our room. We had decided to make a night of it and booked the LEGOLAND® Hotel. We booked a Lego Friends Room and Lily loved it. Her little face was an absolute picture when she saw the room. We were greeted in the room by a safe and it had a little treasure hunt on the top; as you can see from the video we both got a bit excited trying to crack the code (and I had a spot of bother with the safe, but I worked it out in the end!). 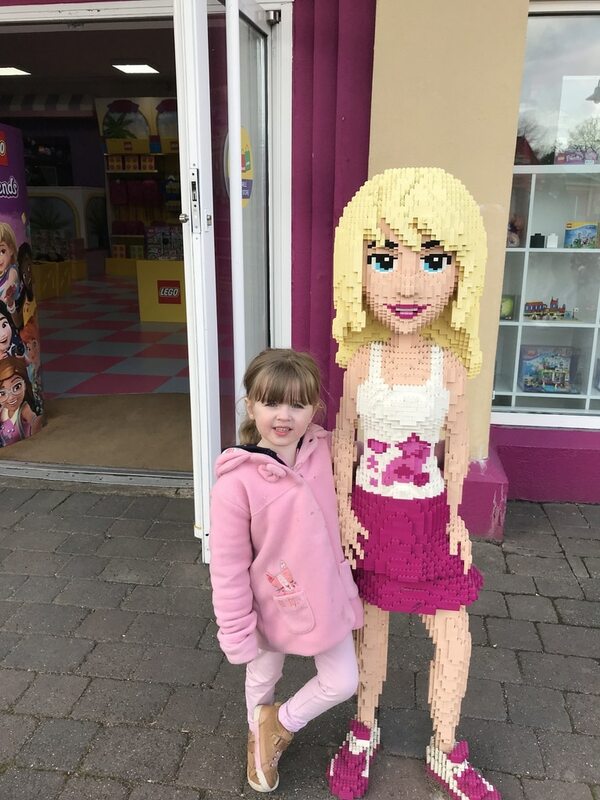 The LEGOLAND® Hotel had great facilities; it had a Pirate Themed Swimming Pool, an early morning and evening activity programme including shows, dancing & meet and greets and a huge restaurant where they serve the buffet breakfast in the morning. As you would expect there is plenty of Lego available to be played with during the stay and even a Lego wall in the hotel so you can build off the wall; Lily really enjoyed that. After checking in, we headed over to the swimming pool for a swim. I didn’t last very long in the pool as it was very hot in there and it played my asthma up. Lily and Mike stayed in there for about an hour and both really enjoyed it. After our swim we went back to the room to play with some Lego and some of Lily’s toys that we had brought from home. The room was comfortable and quiet. 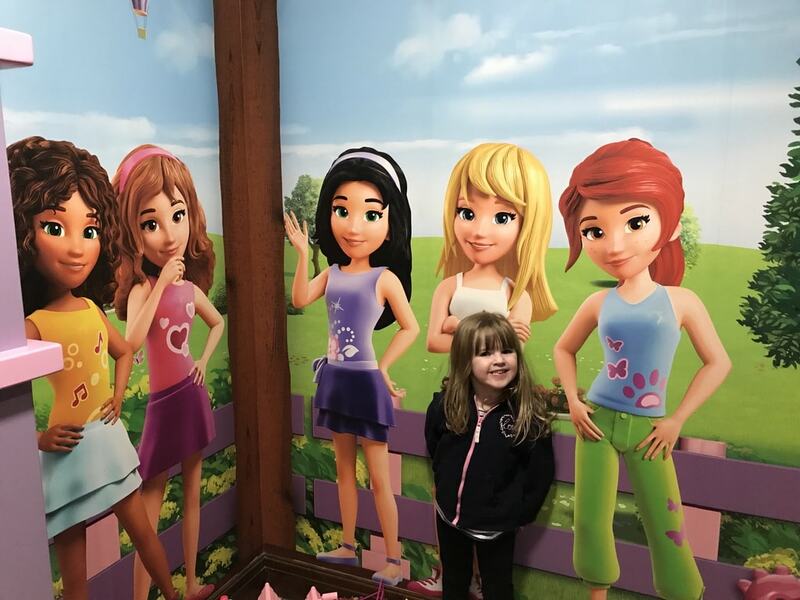 There were life size Lego Friends outside our room and Lily loved going outside and chatting to them! She even cuddled them goodbye on our last day! We decided to go out for our evening meal as only the smaller restaurant was open for dinner and we felt the menu was quite limited and a quite overpriced for what was on offer. We came back to watch the evening entertainment. Lily loved joining in and won a certificate for being Best Female Dancer – she was so thrilled! The entertainment were energetic, engaging and really good fun. After the excitement of the evening entertainment and with the anticipation of a busy day on the park the next day we headed back to our room for some much needed (when isn’t it!) sleep. We got up early the next morning (nothing unusual there!!). We went down for breakfast and we really impressed by the variety of food available to choose from on the breakfast buffet; we stay away a lot and I don’t ever remember having such an extensive choice available. There was even a child height buffet so that the kids could help themselves. After breakfast we went outside to wait for the park to open – as you will see from the video we were the first inside! Staying overnight in the hotel meant we got an extra magic half hour in the park before it was open to day visitors. It also meant we had a separate entrance – straight outside the hotel. As you will see from the video Lily and Mike loved the rides. It was during term time and a lot of the bigger rides were closed. Lily didn’t seem to notice as she just enjoyed those that were open, but Mike was disappointed about some of the ride closures. We visited Miniland while we were at the park too. I remember getting really excited back in the 90’s when we visited Miniland and it was one of the highlights of the day back then. Now though, I felt a lot of Miniland looked tired and in need of some TLC. The new Miniland USA is brand new and really impressive, but some of the older parts like Venice I think are in need of replacement. 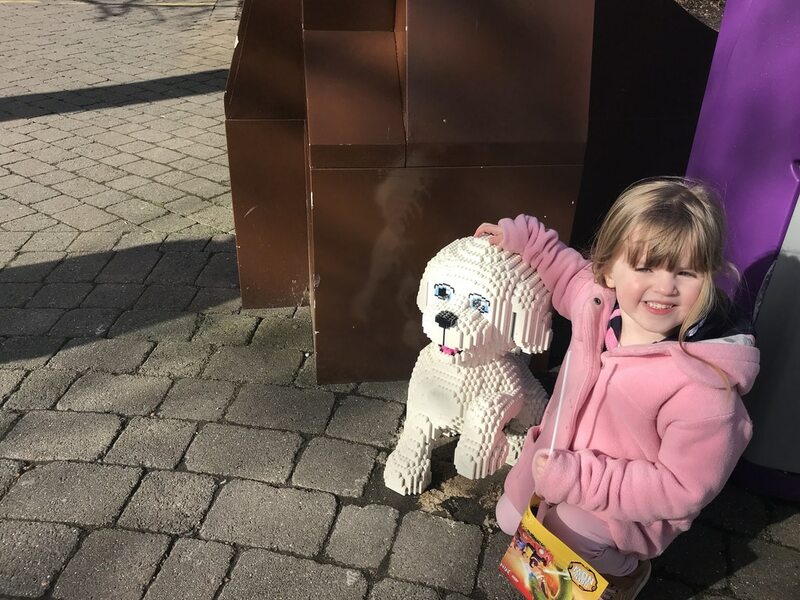 As I am sure you will see from the video, we had a great day out at LEGOLAND® – topped with an Ice Cream sitting by the lake and a visit to the LEGOLAND® shop! Disclosure: We were given our train tickets and our tickets for LEGOLAND® FREE in exchange for an honest review. [AD] 5 Great Toys for Summer!